– the Arms (Bahu) at Tungnath – Mouth (mukh) at Rudranath – Navel (nabhi) at Madmaheshwar and – Hair (jata) at Kalpeshwer. Together with Kedarnath, these places are known as Panch Kedar. The Lingam at Kedarnth is pyramidical, unlike its usual form, A statue of Nandi – the celestial bull stands at the entrance of the temple and exquisitely carved images adorn the interiors of the temple. During the winters, the shrine is submerged in snow and henve is closed. The ideal time to visit is between May to October. Kedarnath is reached through a 14 Kms trek from Gaurikund. Air: Nearest Airport, Jollygrant, 239 kms. Rail: Nearest Railway station, Rishikesh, 221 kms. Road: Kedarnath is approachable on foot from Gaurikund, which is connected by road with Rishikesh, Kotdwar, Dehradun, Hardwar and other important hill stations of Garhwal and Kumaon hills. Local Transport: Horses, Dandies and Ponies are available at Gaurikund for going and carrying luggage to Kedarnath. Situated in the thick green wood, one of the panch kedars, Shiva is worshipped at Rudranath as Neel Kanta close to the temple, a few old rusted swords were found in the crevices of some rocks, believed to be those belonging to the Pandavas. The face of Shiva is worshipped here. The temple of Rudranath at 2,286 m, entails trekking through ridges at almost twice that height before reaching the meadow where it is located. Devotees come to Rudranath to offer ritual obeisance to their ancestors, for it is here, at Vaitarani river (the water of salvation), that the souls of the dead cross when changing world. It is 23 km from Gopeshwar, 5 km of the distance is motorable and the rest 18 km trek. The trek passes through wild orchards & picturesque bugyals and invloves trekking over high ridges. The temple is surrounded by a number of pools - Surya Kund, Chandra Kund, Tara Kund, Manas Kund etc.- while the great peaks of Nanda Devi, Trishul & Nanda Ghunti rear overhead. 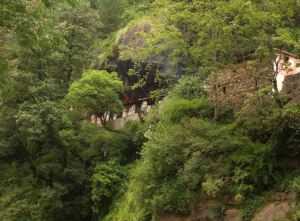 Anusuya Devi temple is located on the trek to Rudranath involving an additional trek of 3 km. Air: Nearest airport is Jolly Grant, Dehradun, 258km. Rail: The nearest railhead, Rishikesh is 241 km. Road: Rudranath is located on Gopeshwar-Kedarnath Road. From Rishikesh, the entry point, Sagar is 219 km. A 22-km trek from Sagar will end at Rudranath. Accommodation available at Dharamshala. Located on the Bank of river Kalpeshwar, is the rock temple of Kalpanath-an-other name for Shiva. Another among the Panch Kedar, the temple of Kalpeshwar offers tourists & pilgrims at fascinating view of the nature. It is the site where Shiva's hair appeared. A favourite spot for sages who come here to meditate, following the precedent of Arghya who performed austerities created the celebrated nymph, Urvashi, here, and the irascible Durvasa who meditated under the wish fulfilling tree, Kalpavriksha. Pilgrims pray at the small rock temple at the height of 2134 m before the matted tresses of Shiva enshrined in rock in the sanctum sanctorum. The sanctum is preceded by a natural cave passage. 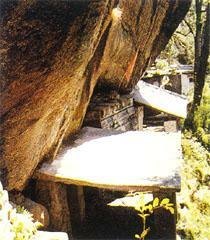 Surrounded by thick forests and terraced fields in the Urgam valley, the temple is reached following a km long trek. Getting there The place is about a 12 km trek off the main road of Alaknanda 2 km before Kalpeshwar is village of Urgam set against delightful nature. Air: Jolly Grant, Dehradun, km is the nearest airport. Rishikesh 55 Km is the nearest railhead. Buses, Taxis are available till Helang, 243 km on the Rishikesh Badrinath road. From Helang, Kalpehswar is km trek off the main road. The arm of Shiva came out at this place as per Kedarnath myth. The Tungnath temple at an altitude of 3680 m atop the Chandranath Parbat, 23-km from Ukhimath, is the highest Shiva shrine among the Panch Kedar. The Sancity of the region of Tungnath is considered unsurpassed. The peak of Tunganath is the source of three springs that form the river Akashkamini. Tungnath is reached through a path that winds through alpine meadows & rheododendron thickets. An hour's climb from here leads to Chandrashila with its panoramic views. The entire journey and the shine are located in some of the finest most picturesque pockets of the Himalayas. The Shiva Temple near source of the Madmaheshwar river is the second Kedar. Administered by sole Pujari and assisted by volunteers of Panwar family of villange Gaundar, the temple's looked after by the Kedarnath Trust. During the six months of winter only the shivling remains inside the temple whereas the silver idols are taken ceremonially to Ukhimath for worhsip. The place known as Saraswati Kund where parpanas are offered, is nearby. 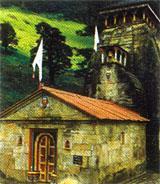 It is said that, after disappearing at Kedarnath , the navel of Lord Shiva reappeared here at Madmaheshwar. Shiva is worshipped here in the form of a navel-shaped lingam. Located at the base of Chaukhamba peak at an altitude of 3289 m the classic temple architecture belongs to the North-Indian style. So sanctified is the water here that even a few drops are considered sufficient for ablution. The natural scenery is dramatically wild, with deep gorges & valleys, mountain sides flung upwards towards the skies, the forests where the snow lies thick in winter, only to be replaced by a carpet of greenery in the summer. Kedarnath & Neelkanth peaks ate visible from here, the entire ring of mountains associated with the life & times of Shiva. The confluence of Madmaheshwar Ganga just short of the temple, is one of the prettiest spots in the region. The best statue of Har Gauri in India, measuring over a metre high is found in the Kali temple.